Two years ago, as I was preparing to graduate my oldest son from our homeschool, we were blessed to have the opportunity to review diplomas from Homeschool Diploma. After seeing the quality, and hearing about their other products, we purchased a cap and gown for Connor as well. Now as I'm preparing to graduate my second son, we again had the chance to review products from this fantastic company. This time, the Crew received the Standard Diploma, with an option to add a Cap, Gown and Tassel. 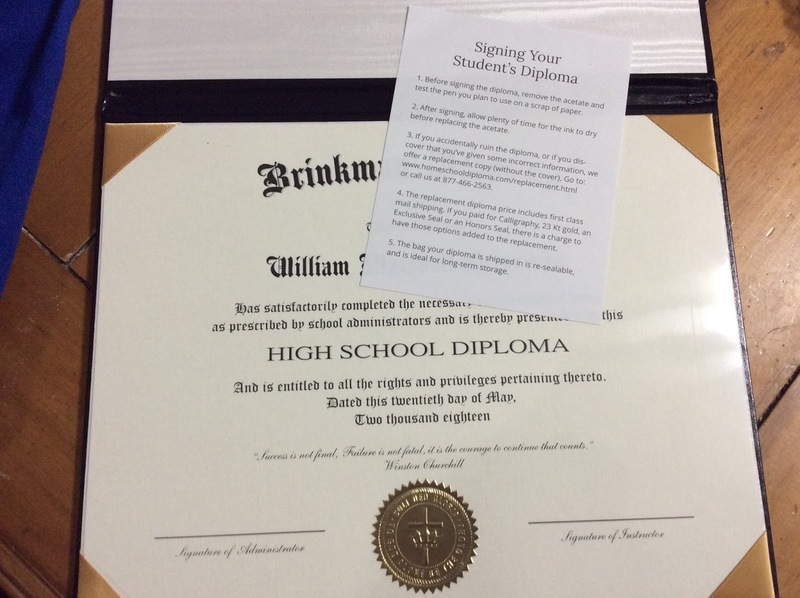 We wanted to customize things a bit more, so we opted for the Personalized Diploma instead. I talked in my previous review about how easy the ordering process is, even if you don't think you know what you are doing. Just follow along, and it keeps asking you questions. Make sure you read everything so you do end up with what you want. 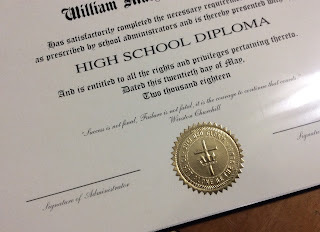 One thing I noticed this time is that they have changed something so that dating the diploma is more obvious. You have the option of choosing an exact date, or a month and year. And you can go all the way back to 2000, so you can get a diploma for those kids who already graduated too! For Connor, we used one of the suggested Bible verses on his diploma. For William, we ended up using a quote from Winston Churchill instead. A custom quote costs a couple dollars extra, but this is what makes this diploma absolutely perfect for him. The quote was also the big reason that we went for a Personalized Diploma. Photo of William's diploma, with the personalized quote. Once you get the order placed, the wait isn't too long. I had mine in about a week, and there is an option to rush delivery too. One thing I really love is how well presented this all is. The diploma is printed on pretty thick paper, and it is all put together in the diploma cover, which holds it very securely. As you can see in the photo here, you even get instructions on how to sign the diploma. Which reminds me that I don't think we ever signed Connor's. Hmmm. This is all so much better quality than my high school diploma was! The cap and gown is wonderful too. You measure based on their height, in the shoes they will wear for the graduation ceremony. The smallest gown on the page is for students who are 4'9", and gowns go up to 6'8". Fortunately, we didn't have to go quite that high. This time, we got the gown for people who are 6'3" to 6'5". Maybe, just maybe, I should have gone with the smaller size, but this is Thomas trying it on, and he doesn't graduate for another two years. And he is still growing. The matte finish looks great, though they also have a shiny finish option. We liked how sturdy this looked. Then it is a question of figuring out just how to present this to your child. For Connor, we ended up having a ceremony one Sunday afternoon. Our church allowed us to do it there, and we ended up with multiple people speaking, and the elders prayed for all of the graduates (two other graduates were in attendance). It ended up more formal than we are likely to do for William. Right now, we're thinking that we'll do a lower key version of that for him, though we might need to do a Saturday event instead. Do a slide show, get a couple of people to say a few words, present the diploma, and have the elders and others pray over him, and any other graduates present. Can I just say that I do think it is hugely important to do something to acknowledge these milestones. And I think it is as much for Mom as it is for the graduate. Doing something publicly, in front of so many friends and family, really mattered to me far more than I expected it to. There was just something more "real" about having our little ceremony and telling people that he was done with high school. I didn't know I needed that closure, but I do think it made a difference for me, and I also know that there were many people at church and elsewhere who loved having the opportunity to cheer Connor on. I expect the same for William. It doesn't have to be a big production, but it can be too. I just have come to realize that these rites of passage are important to more than just the person passing from one stage to the next. 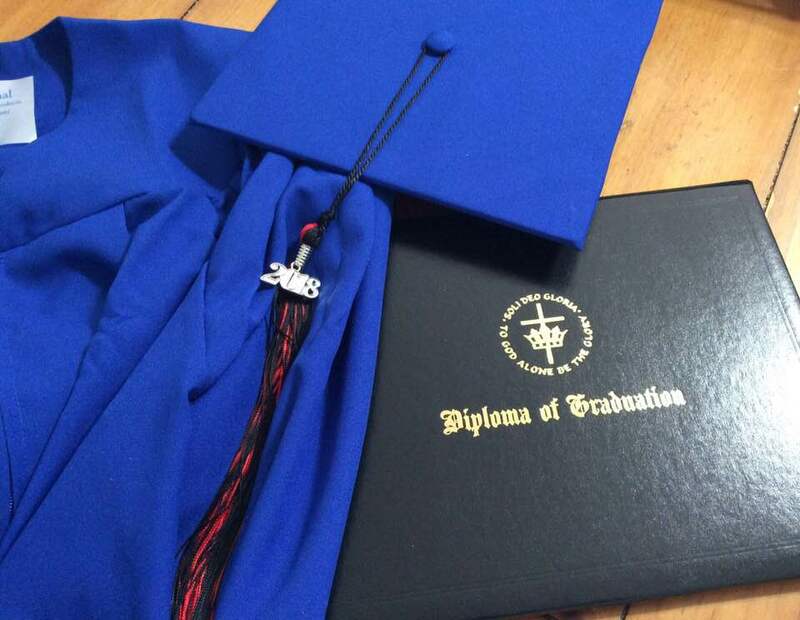 Other Crew members reviewed their 8th Grade Diplomas or their adorable Kindergarten Cap, Gown, Tassel and Diploma. Go, check that out! The cap and gown look great! I really like the matte finish. I see that they also have kindergarten items. I will definitely have to keep that in mind. I also like that you can add a custom quote to the diploma. What a nice feature!